The C11 nave and chancel (probably originally apsidal) have later windows. The tower is C17 and there is C17 glass with brasses that date from the C15 to the C20. The church stands on high ground near the confluence of the Arun and the Rother. Most houses are nearby, well away from the fine C15 bridge, where the risk of flooding was too great. The aisleless nave and chancel are built of rubble and the long and short work of the south east nave quoin shows it is C11, as are the round headed and shafted north and south doorways. The south one has strange capitals of concentric rings, quite unlike most capitals of the period. Though more conventional, the cushion-capitals of the north one (visible from the vestry inside) are sufficiently similar to belong to the same build. There are parallels with the doorway at Bolney. The rere-arches are significantly taller and the relatively wide proportions look late C11, though Parsons and Milner-Gulland (p112) incline to a pre-Conquest date. However, the broad dimensions of the broad chancel arch do suggest a date late in the C11. It has square responds and square abaci and a roll-moulded head, whilst it has no through-stones. The roll-moulding is certainly integral, contradicting Fisher’s suggestion (p190) that it was added to a plain arch. The stones of the chancel are larger than the nave and the head of a small blocked north window is formed from a single stone. Inside, is a deep round-headed east recess with thick corners. As the external plan is square, Poole suggested (SAC 87 (1948) p49) that the east end was originally apsidal and was altered in the C17. Only excavation could prove this, but it is plausible. Although the church mostly keeps its C11 dimensions, it has undergone considerable later change. The side-lancets of the chancel have rounded heads so they are early C13, like the chamfered and pointed altar-recess north of the chancel arch. 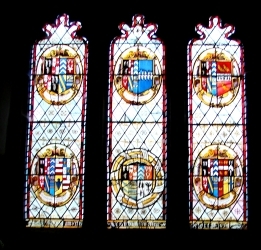 Most other windows are C14, of two lights with quatrefoils in the heads. 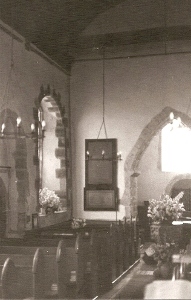 At this time lower plain, pointed arches were inserted in the doorways. The church has been long associated with the Barttelot family, who have owned property in the parish since at least 1296 (3 p308). The monuments and glass (see below) show that the association was at a peak in the C17 and it is likely that the family was responsible for the early C17 changes. Godfrey provides the date 1614 (1 p22) for the tower, in which case it is surprising that according to the survey of 1636 (SRS 98 p133) it was then in a decayed state. It is possible that it replaced an earlier one and it is barely higher than the nave with a tiled pyramid. Like much earlier C17 work is plain and unbuttressed, leading Fisher to assume it was ancient (ibid). However, the almost triangular tower arch is certainly not C11, nor is the blocked west doorway with an elliptical head nor the window of two uncusped lights. Whenever the east end was altered, a three-light square-headed east window, which could be C15 or early C16 in origin, was inserted in the new square east end. 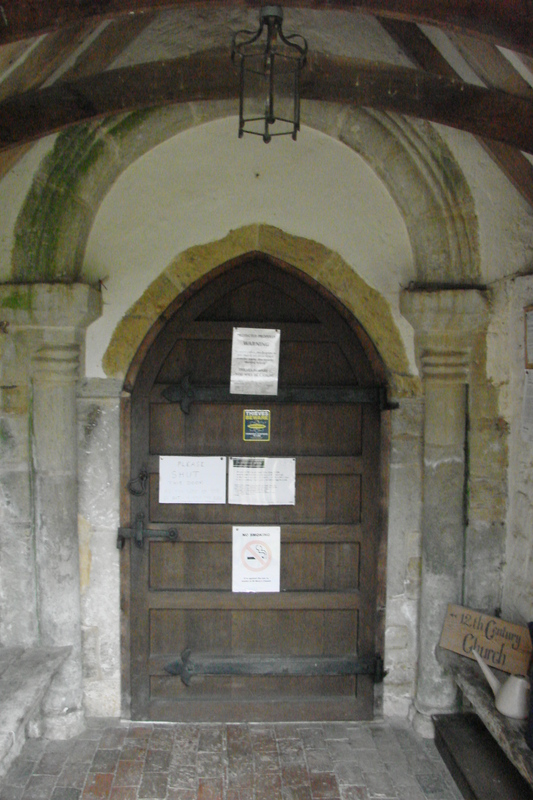 The stone south porch replaces a boarded one seen in the Sharpe Collection drawing (1805). 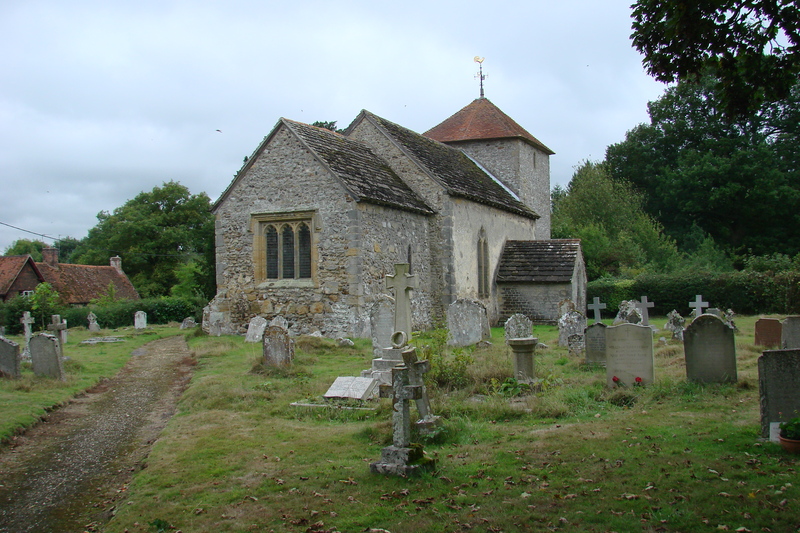 Other C19 work included new roofs, the vestry on the north side of the nave and a south east nave window, a poor copy of the others with shallower cusping, which is not on the Sharpe drawing. The architect and date are unknown. In 1952 there were repairs by H Sherwood (ICBS). Brackets: (On chancel arch, just beneath the abaci) Stone and intended for the rood beam. (Concealed beneath carpeting) The Barttelot brasses run from the early C15 to the early C17, when there were extensive repairs and additions, reflecting an increased interest in genealogy; the workshop responsible for these changes was that of E Marshall in London (J Bertram (ed) 1996 p5). The C15 ones include references to the service of successive members of the family to the Earls of Arundel (Saul p347). The slabs of two of the C17 ones have been identified by Roger Birch (p45) as made from Sussex marble. There are later plain inscriptions and wall-tablets. 1. (Nave floor) John Barttelot (d1428) and his wife. It has been dated to c1460-65 (H W Macklin in Mundy (ed) pp141-42) and belongs to London workshops Series D. The man’s head was replaced in the C17 though a C17 group of youths beneath is probably unconnected. 2. (Nave floor) John Barttelot (d1453) and his wife Joan. Jerome Bertram (Monumental Brasses ibid) has identified these as basically made around 1470 by the rare Sub-group B’ of the London workshops. There were alterations around 1630, though there are contemporary parallels for the fantastic armour, which might otherwise be assumed to be part of the C17 alterations. 3. (Nave floor) Richard Barttelot (d 1482) and his wife. The inscription is in obscure and convoluted Latin verse. 4. (Nave floor) William Barttelot (d1601) and his wife. He is said to have been aged 97 when he died. Both effigies are small. 5. (Chancel floor) Richard Barttelot (d1614) and his two wives. The complex heraldry at the top displays the ancestry of the Barttelotts since the C13. Font: Worn and battered C15 octagonal bowl with a rounded quatrefoil each side and trefoiled arches on some sides of the stem. 2. (Nave north window) Early C17, depicting Brian de Stopham (d1273) in mediaeval dress with an early C17 member of the family. The glazier signs his name as Roelant. The Burrell Collection drawing (1780) shows there were later changes, presumably during repairs in 1853, though the delightful caryatids look original and the whole is a remarkable example of family pride. 3. (South and north chancel windows) M O’Connor and Taylor, 1876 (one signed). Piscina: (South chancel) Round-headed and early C13.